Jasper National Park, Alberta to North Battleford, Saskatchewan. 5:15 am we got up to get an early start on our trip across Alberta and into Saskatchewan. Looking out the window with sleepy eyes we were greeted with 7 elk checking out our Rockwood trailer... I told them quickly "it is not for sale" so they went knocking on the neighbours door instead. Wow those are big animals! More Elk. They look pretty scruffy this time of year, just loosing their winter coats. 37 minutes later we are rolling out of Jasper, out of the Rockey Mountains, into the Foothills and out on the prairie. What an incredible country we live in, it never seems to amaze me. Leaving Whistlers Campground in the Morning Sun.... Coffee in hand of course. 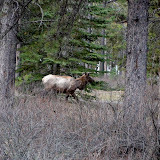 Many more elk greeted us on the way out of the park, no Bighorn sheep this time, maybe next. We smoked past Edmonton taking the by-pass with Liz (lead foot) at the wheel. We made a quick stop in Elk Island National park just east of Edmonton. This national park is a bit different and is home to herds of Buffalos.... you just have to see it. Camping is also available in the park. On the road again we headed for the border town of Lloydminister. This is a true oil town and is home to the Husky Up-Grader that turns the black sticky crude into usable fuel. We fueled up the truck and set our sights on my sister and brother in-law's farm just north of North Battleford. Large trucks on the road passing us. The truck was getting a good workout with 65 km/hr head winds. The fuel consumption increased by 25% fighting the wind. We arrived shortly after 5 pm and were greeted by my sister Rose and my mom Ruth (mom lives in the town of North Battleford), Al was as usual working late seeding this years crop, 14hr plus days, makes me tired just thinking of it. Left is my sister Rose and on the right my mom Ruth. Rose and Al are both superb chefs with Prairie Hospitality, got to love it. OK now I am on a roll traveling down the highway with you two adventurers! BIg!!! Mountains, highways, buffalo, elk, sky, parks, campgrounds and more are all calling out for attention and enjoyment. Even if I am a few weeks behind you I am still enjoying every scene, those familiar to me and those that are new. Lovely to see your sister and your Mom, Anders. Interest in food, wine and cooking runs in the family I am guessing! You two are poster kids for the "Love Canada" Fan Club. Since long trips sitting down are not easy for me yet, I am really enjoying traveling with you in the comfort of Treetops! !